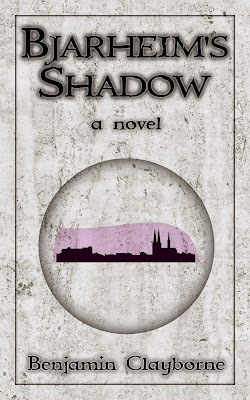 If you missed it, check out Part I and Part II of Bjarheim's Shadow! Erik sprinted away from the spreading shadow, but after a few steps he jerked to a halt. Kari! What am I doing? He turned back, then flinched as she shot past him. “Why’re you stopping?” she shouted. “I—wait—” He cursed and followed, sparing a glance backward. Missus Fray galumphed down the street after them, not making a patch on their speed, but clearly staying ahead of the shadow. “Go!” she called. The shadow had already spread over the first houses at the end of the lane, as if some giant had blotted out the sun, despite the cloudless blue sky. A stream of folk began to drain away from the edge of the city as shouts went up. Erik nimbly danced between them, keeping Kari in his sights. Thankfully, she glanced back and slowed a little when she saw how far behind he was. When he came abreast, he clamped his hand in hers. She shot him a surprised glance, but did not pull away. They made for Erik’s house. It was further into the city, but if the shadow kept spreading, his home would be engulfed in minutes. When they rounded the corner into the lane, Erik stopped short. His house, and those on either side of it, were already covered in a deep shadow. “No… Magnus!” He blindly ran forward, but something twisted his arm back. “The Conclave. At the Cathedral.” He glanced at the shadow again. It had spread into the street and was closing on them at an alarming rate. My home… Magnus… “Let’s go,” he choked out, and turned his back on it. The markets, the Cathedral, Riverwatch… Someone there would know what to do. The Shadow had come without warning. And with Remy’s help! Why in all the hells there were would Remy ever do such a thing? Why would he want to destroy Bjarheim? “The fae tunnels,” he said, grabbing Kari’s hand. “Got a better plan?” he shouted as they ran from the clog. On the next lane, he stopped between two old houses. A small shack stood between them, with a rickety door that groaned when he yanked it open. There was no floor, just a ragged hole, with a terrifyingly ancient ladder descending into darkness. “Oh, sure. Lecture ’em while they eat our bones,” Kari said, only half in jest. Erik carefully swung onto the ladder. It creaked, making his stomach lurch, but held. He went down as fast as he dared, and sighed relief when his foot landed on hard dirt. Kari followed, cursing when she bumped into him in the dimness. The only light leaked from the hole above; twenty feet into the tunnel, they were in near blackness. Erik felt along the wall with one hand, keeping Kari’s hand tight in his other. That tingle came back whenever they touched. He felt his heart racing in his chest; was it the fear, or her? “Hello?” he shouted. There was no reply. The tunnel floor dipped and weaved so much that he had no idea which way he was facing now. He’d been here once before, on a dare, and hadn’t made it fifty feet before chickening out and turning back. Of course, he’d told everyone he’d had tea with the fae. “They ain’t scary at all,” he’d lied. Well, he was going to meet them now. Then what? Were the stories true? The fae couldn’t be some sort of violent cannibal race; they treated with menfolk all the time, Erik knew that much. It was their magic that kept the city safe, as much to protect themselves as the humans living above. But even allies might not take kindly to unexpected visitors. Even if the Shadow really was in Bjarheim. The violet lines grew brighter as they went. Abruptly they came around a sharp bend, and the tunnel opened onto a vast cavern. The floor dropped away before them. There seemed to be nowhere to go. Kari leaned out over the abyss, heedless of the drop. Erik wasn’t afraid of heights, but a sensible person should be more cautious. “Somethin’ down there,” Kari said. Erik gulped and looked down. Figures moved, and he could make out something like voices. It was hard to tell. “Look! A path.” Kari pointed. Sure enough, the tunnel floor angled around a protruding rock face and curved away down the side of the cavern. It was narrow enough to walk safely. Barely. Before Erik could object, Kari began sidling along the precipice. Erik licked dry lips and went after her. Keep your eyes on her, he told himself. At least that part was easy. The path stayed gratifyingly even. About halfway down, he heard shouts, and looked down again. The floor was a lot closer now, and his nerves settled a bit. The shapes below were pointing up at them. “We shoulda knocked,” he said. Whoever they were, they didn’t start throwing rocks or casting spells at Erik and Kari. The path widened, much to Erik’s relief, as they descended the last few feet to the cavern floor. And there, at the foot of the path, Erik at last met the fae. They were men, as a child’s fancy might invent them: tall and spindly, their skin a pale, bluish-gray; their noses sharp and their eyes large. Their irises coruscated like oil floating on water. They wore clothes, like any ordinary men and women might: shirts, vests, trousers, blouses, dresses. No boots, though; their feet were scaly and clawed, like lizards’. Their mouths were wide, wrapping almost all the way around their faces. And to a one, they were greatly agitated. A crowd of ten or twelve had gathered, while others stood farther off, hopping from foot to foot and wringing their hands. “We felt nothing. 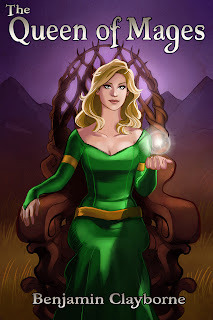 I felt nothing,” the tallest of the fae said, his voice booming and echoing across the chamber. It was surprisingly deep, given how thin-chested the fae man was. He glanced accusatorily at his fellows. One of them shrugged; another, with long, glassy white hair, growled and yanked a knife from his belt, shouting incoherently—no, wait, it was some kind of language. Is that what fae-speech sounded like? The tall fae who’d spoken first made a curt chopping motion at the knife-wielding fae, who grunted and put his knife away, then rudely shoved off through the crowd. “What was that?” Kari whispered to Erik. “She’s no such thing!” Erik said. He quailed a little when the tall fae raised an eyebrow at him, but stood his ground. Some of the other fae adopted looks of concern, embarrassment, or outrage. “What bargain?” Erik whispered to Kari. She shook her head. The tall fae spun back around. “What Bargain?” he shouted. “You have the effrontery to—to—” He began shouting at them incoherently; but no, it was that fae-speech again. Erik eyed the pathway, considering a run for the surface. Even that shadow, that—siktar? Whatever it was, it couldn’t be as bizarre as this. “We’re sorry,” Kari said over the fae’s rant. “We’re just kids. We don’t know about any bargain.” She still squeezed Erik’s hand so hard he thought it might break. He prayed she wouldn’t let go. The climb upward was not nearly as terrifying to Erik, mainly because he was so disoriented from whatever the tall fae had been talking about. Bargain, siktar, isnikt… everything was multiplying. When had Da been planning to tell him about all this? Why hadn’t Magnus? I hope that big lump is all right, Erik thought, even as angry as he was. Well, if the fae was telling the truth, then this siktar wasn’t going to kill them all… but Erik still didn’t like the looks of it. They reached the top of the cavern and returned to the tunnels, passing from the faint violet glow and into darkness again. Much sooner than Erik expected, they saw light ahead, and the ladder. But when they emerged into daylight, he realized that they were in a very different part of the city. “We’re close to the Cathedral,” Kari said, having come to the same conclusion. There were no crowds here blocking the way. “And to Da. He’d better explain all this. Come on.” Da was going to explain, or Erik would… would… Would what? You going to make him? With those skinny arms? Erik grumbled at the sensible voice. Erik stumbled to a halt when he saw a crowd of men striding down the street toward them. Bulky men, all wearing identical leather aprons, inscribed with an arrow-pierced black circle—“Ironspeakers!” Kari said, breathing hard. She’d let go of his hand while they’d been running, but now her fingers laced into his again. Even amidst all the confusion and fear, Erik felt that tingle return. Maybe everything about Remy had been a bad dream, something Kari already regretted—She must, after what Remy did with that shadow, right? Erik focused on the group of ironspeakers; a dozen or so of them, it looked like. Anything made of metal came from the ironspeakers; they could craft the most intricate metalwork using just their hands and voice. It was some sort of magic, anyway. They didn’t let outsiders watch them work. But every runner in Bjarheim had, one time or another, huddled up against the warm wall of an ironspeaker’s forge, listening in the quiet dark for the deep songs that rumbled from within. Songs you could never forget, that you could never duplicate, no matter how hard you tried. Whatever they did in there, they did sing. “Maybe they’re gonna fight that shadow,” Erik said. The group of ironspeakers was halfway to the edge of the city when they came to a stop. Erik’s stomach lurched when he saw the shadow, the siktar, roiling toward them again. One of the ironspeakers grunted something at his mates, then walked off alone to meet the spreading shadow. He knelt down, and began to sing. It was just as Erik remembered: the bass hum flowed through his bones, but somehow here it was louder, purer, even though the ironspeaker was a hundred yards off. Kari climbed up onto a fae lamp-post to get a better look; Erik followed. The shadow continued its slow crawl, and as it came up to the ironspeaker, he put his hand out to touch it. The shadow recoiled from the ironspeaker’s hand, then struck like a viper at his face. The ironspeaker’s song cut off with a cruel disharmony, like a music-box smashed with a hammer. The man collapsed to the ground. The shadow flowed over him, unimpeded. Kari gasped. Erik clung to the fae lamp, riveted. The other ironspeakers shouted with alarm and spread out into a line. They began to sing, and their hum filled the air, making Erik’s whole being vibrate. He thought he was going to burst. “Stop!” someone bellowed. Erik looked across the road at a group of fae standing there. Leading them, his arm outstretched, stood the tall fae they’d met down below. The ironspeakers faltered. A few of them took tentative steps back from the shadow. “It is a trap,” the tall fae said, striding forward. “Your magic will poison you.” He brushed past the ironspeakers and gazed down at the shadow. It seemed to have slowed at his approach. “Hm,” he said, and pointed a finger at it. The shadow recoiled again, but this time it did not strike. It hovered there, waiting. Then, with a loud pop, it sprayed a stream of black liquid into the air. The tall fae jerked aside, barely dodging it. Some of the liquid splashed on the boots of one of the ironspeakers behind him, and the leather began to sizzle and smoke. The ironspeaker shrieked, flailing to kick his boots off. Erik hopped down from the pole. “What does he want?” Kari asked, following him down. “Of course it would be you,” the tall fae hissed, having covered the distance between them in seconds. He blatted something in fae-speech that sounded like a curse. “Come.” He grabbed Erik’s arm and dragged him over toward the shadow. “What? How?” Erik said, perplexed. He hadn’t the faintest idea what the fae meant. “It will be obvious!” the fae shouted. “Now hurry!” He pointed at the shadow again, which had begun to creep forward once more. Erik stood paralyzed. He watched as a ball of light coalesced out of the air before him. “Now!” the tall fae said. “Now is not the time!” the fae shouted at him. Erik crossed his arms. He’d been bullied enough by people he knew. He wasn’t about to let this idiot… thing order him around. Erik turned back to the violet light. He reached out and, for lack of a better idea, stuck his finger into the ball. It pulsed brightly, sending waves of ice cascading up his arm. He shivered, but held still. Direct it into the shadow, Aiar had said. Erik had no idea what that meant. He glared at the ball. Well? Move! Without warning, the ball lurched forward and down, colliding with the shadow. A tremendous flash of light blinded Erik; he threw his arm over his eyes as a colossal blast hurled him to the paving stones, and into darkness.